KARACHI: The Sindh Govt has finalized the multi dimensional strategy to dispose of pending surplus stock of wheat and purchase fresh crop wheat from the growers at highest rate of the market Rs 1300/= 40 Kg on Tuesday . 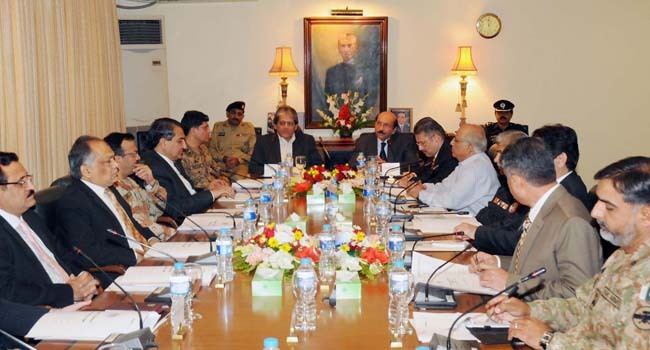 The Ministerial Sub-committee for food in its meeting presided over by the Chief Minister Sindh Syed Qaim Ali Shah at CM House Karachi today decided under directives of the Chair, initially to open wheat procurement centres at the areas of Hyderabad and Mirpurkhas Divisions from March 15, 2015 with efficient supply of Bardana (Gunny Bags) purely to the growers without fail. The meeting also opened the new window of 6 months credit with Bank guarantee to sale the wheat to traders on subsidized rate of Rs 3250/= per 100 Kg or bag and also continue efforts to export the same. Keeping in view of recession in the International Market, The meeting recommended to the Federal Govt to keep its offer of rebate of $45 US on per ton export intect till the internationals market is improved / raised and suits to export. The members of Ministerial Committee the Sindh Minister for Finance Syed Murad Ali Shah, Sindh Minister for Health Jam Mehtab Dahar, Sindh Minister Excise & Taxation Giyan Chand Essrani, The Secretary to CM Alumuddin Bullo, Secretary Food Saeed Awan, Secretary Finance Sohail Rajput, Director Food Muhammad Bachal Rahpoto and other officers attended the meeting. It was also decided to shift the pending stock of wheat from Sukkur, Ghotki, Khairpur godowns to Karachi and ensure to supply monthly requirement of 2 million ton wheat to the Karachi market in addition to export or sale it to the local traders. It was also decided that the gudown of Shaheed Benazir Abad, Nausheroferoz , Jamshoro etc be vacated by sailing the wheat local traders before the complete harvesting of fresh wheat crop. The meeting also reviewed the district wise procurement plan with district wise target and supply of Bardana to growers and decided that all the procurement centres established last year to be continues this year as well. It was also decided that district wise wheat procurement committees representing all stake holders under the supervision of DC concerned should also be constituted for the satisfaction of the growers. The Chief Minister Sindh Syed Qaim Ali Shah while addressing the meeting directed the officers to give priority to the small Khatedars while procuring the wheat in the field. He strictly warned to officers not to provide Bardana to the traders but to follow the instruction by District Wise Committees. He said that with Grace of God, the Per Acr yield of the Sindh province was increasing year to year as such today we are in surplus of each Agro product including wheat. Besides, un expected import of 7 lac ton wheat with the permission of Federal Govt has imbalanced the market and created problem for the Govt. However he maintained that Sindh Govt was trying its best to overcome this issue. The Chief Minister also directed the officers to take crackdown operation against the hoarding and illegal movement of wheat into province on the boarders. He allowed the officers to use the law under section 144 crpc as soared against illegal movement of wheat. He directed the officers to create market for disposable of pending wheat and also to prepare strategy from now to export the wheat after harvesting new crop in month of May-June, when traditionally International Market to be high. He said PPP Govt is spending huge amount in Billions to protect the rights of the growers and consumers and it to continue in Future as well. The Sec Food Saeed Awan while briefing the meeting said that at present Sindh Govt has about 8,90,000 ton in pending. He said that as many as 46,000 ton wheat has been disposed of recently while this process was in progress. He informed that a deal to dispose of 4 lac ton wheat on 6 month credit with Bank guarantee was about ready to execute. In addition to that only Karachi needs about 1.5 to 2 lac tons in a month and by the month of April and early May about 4 lac tons could be disposed of during the period. He said that presently the food department was issuing wheat from godown of Ghotki, Sukkur and added that by complete harvesting of fresh crop of wheat in the month of April and early may, the Gudowns of Shaheed Benazirabad , Nausheroferoz, Jamshoro and other district be vacated for fresh procured wheat stock. He said that as per the decision of the ministerial sub committee, the Food Department has made complete arrangement to procure the 9 lac tons of wheat from the field. He said that arrangement of required Bardana and staff has been completed.